Note that the original graph has an edge a -> d, but this is absent after the reduction because we can get from a to d via b (or c). It would be fun to explore using this technique to mine taxonomic papers and automate the extraction of classifications, as well as names. Paulo Nuin recently interviewed me for his Blind.Scientist blog. The interview is part of his SciView series. This thesis develops a quantitative cladistic approach to panbiogeography. Algorithms for constructing and comparing area cladograms are developed and implemented in a computer program. Examples of the use of this software are described. 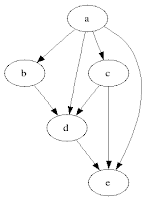 The principle results of this thesis are: (1) The description of algorithms for implementing Nelson and Platnick's (1981) methods for constructing area cladograms. These algorithms have been incorporated into a computer program. (2) Zandee and Roos' (1987) methods based on "component-compatibility" are shown to be flawed. (3) Recent criticisms of Nelson and Platnick's methods by E. O. Wiley are rebutted. 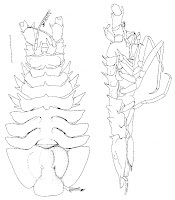 (4) A quantitative reanalysis of Hafner and Nadler's (1988) allozyme data for gophers and their parasitic lice illustrates the utility of information on timing of speciation events in interpreting apparent incongruence between host and parasite cladograms. In addition the thesis contains a survey of some current themes in biogeography, a reply to criticisms of my earlier work on track analysis, and an application of bootstrap and consensus methods to place confidence limits on estimates of cladograms. Slides from the recent Phyloinformatics workshop in Edinburgh are now online at the e-Science Institute. In case the e-Science Institute site disappears I've posted the slides on slideshare. Heiko Schmidt has also posted some photos of the proceedings, demonstrating how distraught the particpants were that I couldn't make it. Interesting paper in PLoS ONE (doi:10.1371/journal.pone.0001124) on the quality of data housed in GBIF. The study looked at 630,871 georeferenced legume records in GBIF, and concluded that 84% of these records are valid. 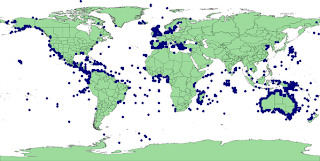 As examples of those that aren't, below is a map of legumes placed in the sea (there are no marine legumes).